We all have fond memories of playing outdoors as children. For little ones, a garden is a place where your imagination can roam free; the washing pole can become the mast of a ship on a stormy sea, the picnic table transforms into the perfect hiding place in a game of hide-and-seek, or the lawn a football pitch in an arena of screaming spectators. It’s important that you encourage this sense of adventure, but there are some precautions you can take to make sure your mini explorers remain unharmed in the garden. Wasp nests and beehives can potentially be very hazardous for small children, especially if they’re allergic to stings. Wasps’ nests can be common, and if you have a wasp nest in one of your garden buildings, don’t try and tackle it alone. Instead, hire an exterminator for peace of mind. To keep your garden wasp-free, hang a blown up paper bag from a prominent spot. Wasps are fiercely territorial, and will avoid anything that looks like another wasps’ nest. Power tools, paint stripper, wood stain and other DIY and garden tools should be locked away in the garden shed at all times. Invest in a sturdy padlock for the shed door, and make sure all family members work to keep it secured. If you’re working outside with tools, don’t leave them unattended, and if you have freshly painted a fence or sprayed weeds, make the garden strictly off-limits. When the weather is scorching, there are a few important steps you can take to counteract the risks of sunburn and heatstroke. Don’t let little ones play in the midday sun – they can quickly become overwhelmed by the heat. Equip kids with a hat and sunblock, and make sure there are plenty of cooling treats available in the kitchen when all that running around gets too much! Trim back thorny plants like rose bushes and prickly shrubs to avoid little bodies getting tangled or scratched. Remove any plants that bear berries other than those which are considered safe to eat. Fortunately, most plants are very safe, but even common blooms like foxgloves, daffodils and hyacinth can prove toxic if eaten. Educate yourself and your little ones to avoid nasty tummy aches. Image by David K used under the Creative Commons license. I remember those days with my kids lol! I cannot wait to see my garden again! I ripped out a bunch of overgrown things and the kids and I are planning replacements for spring! what a beautiful photo, a dream garden. We still haven’t even got a blade of grass in our garden and we moved in over 2 yrs ago – the builder did get the grading done towards the beginning of fall last year, too late to put down sod though. Most likely it will be done this spring? Ha! 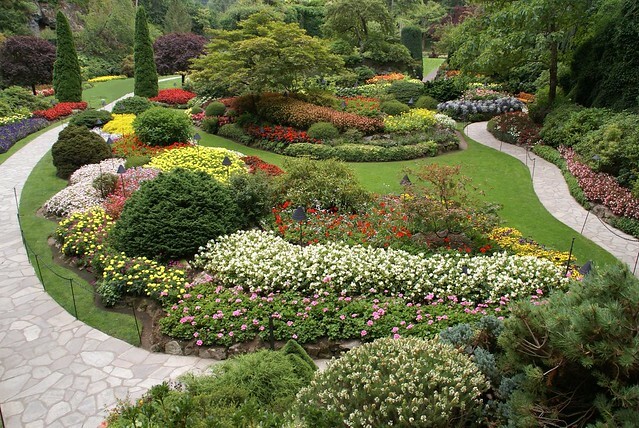 I wish my garden looked like that! « Delicious Cheesy Dip Recipes!